Pajama Press has been given the wonderful opportunity of hosting a series of reviews written by the very people we work so hard for: kids and teens! Today our reviewer is Michaela from Trillium Woods E.S., and the book is Namesake by Sue MacLeod. Hey, I am Michaela, I am a grade 8 student from Trillium Woods E.S. 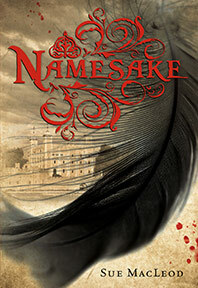 I have been given the opportunity to read the book Namesake by Sue Macleod for this blog. This book is about a young teenager Jane Grey, who is living in Halifax with her dysfunctional mother. Ever since Jane’s dad passed away in a motorcycling accident, Jane’s mom has been acting more and more moody every day. Jane’s life starts to change when her history teacher introduces a new project to her. She has to research any interesting person from history, She decides to research Lady Jane Grey, who ruled Tudor England for 9 days. Jane is writing her history paper when she finds the Book Of Prayre, Lady Jane’s prayer book, mixed in with her library books. She reads a passage out loud and is suddenly in 16th Century England. She meets Lady Jane Grey, and the two of them form a true friendship. Jane finds herself returning into the past continuosly, she is trying to forget her own problems. As Jane gets more enveloped in the past, can she fix both her own problems as well as Lady Jane Grey’s? I thought this was a well written book, and the author successfully made us understand the language that they spoke back in the 16th century. In the beginning, there were a few slow parts, but the end is amazing! Overall it was a very enjoyable book, and you will have to read this book to find out yourself! Thank you, Michaela, for your review! “Alma Fullerton is an award-winning children’s author living in Midland, Ontario. Although she’s an accomplished visual artist, her newest book, Community Soup (Pajama Press), is the first book she’s illustrated herself. Directed towards children ages four to seven, Community Soup gives young Canadians a fun look at everyday life in a Kenyan village, including a mischievous herd of goats. Pajama Press has been given the wonderful opportunity of hosting a series of reviews written by the very people we work so hard for: kids and teens! Up first is Joshua from Barrie with his review of Nix Minus One. Hello I am Joshua I am a grade eight student in Barrie. The book I have read is Nix Minus One by Jill MacLean. The reason I read this book is because I think Jill Maclean is a very good author and I have read many of her books and really enjoyed them. This book is a very entertaining book that makes you want to keep reading because you get so caught up in the emotions of some of the characters. The main character Nixon, goes through a couple of the biggest changes in his life. Nixon is a 15 year old guy who isn’t very popular and his sister Roxanne, known as Roxy is falling for one of the most dangerous guys in school. Bryan Sykes is known to be a drug dealer. Nix would do anything for his sister, but when Roxy doesn’t come home from her friend’s party Nix get very worried. Nix only has a couple friends. Chase McCallum and his sister who they call Blue who seem to be everywhere in the book but Blue is mostly in the barrens bird watching. In conclusion I believe that this book is really entertaining for people who enjoy realistic fiction because I really got attached to Nix and his familyi. I think readers would find some similiarites of this story to their own lifestyle and overall it’s just a good read. I would rate this a 9.5/10. Thank you, Joshua, for your review! Nix Minus One is an Open Book Toronto “Sizzling Summer Reading ‘Kids’ Can Lit'” pick!